Coma is a fairly common problem encountered in emergency departments (EDs) across the country. Approximately 3% of all ED patients arrive in some sort of altered mental state. The differential diagnosis is broad, but initial evaluation should center on treating any reversible causes and attempting to differentiate a structural brain lesion from a more systemic toxicity. Approximately 85% of altered mental status cases are caused by metabolic or systemic derangements. Structural lesions cause 15% of cases. Consciousness is the combination of arousal and cognition. Arousal is synonymous with awareness, both of self and surroundings. The primary neuroanatomic structure responsible for arousal is the ascending reticular activating system (RAS), located in the brainstem. Cognition is the combination of orientation, judgment, and memory. The structures responsible for these crucial components of cognition are spread throughout the cerebral cortices. Therefore, in order to be awake, aware of our surroundings, and fully oriented, we require intact cerebral cortices and an intact RAS. A fully comatose state implies dysfunction either in both cerebral cortices or dysfunction of the brainstem where the ascending RAS fibers originate. Importantly, localized, unilateral lesions in the cortex, such as a cerebrovascular accident (CVA), tend not to induce a coma, unless there is massive herniation. Localized lesions to the brainstem however can impair the RAS and lead to altered mental status (AMS) or coma. The overall goal of the examination in a comatose patient is to identify key clinical findings that will help narrow your differential diagnosis of the patient's comatose state. In addition, it is useful to accurately document the patient’s current condition so that subsequent exams can accurately describe any dynamic changes in clinical status. With that goal in mind, below you will find an interactive diagram of a comatose patient which highlights key components of the examination and initial evaluation to help you narrow your differential diagnosis. Click the links to open up text boxes with further descriptions. The GCS (although developed for trauma) can be used to quantify level of consciousness. This is especially helpful to track changes during serial exams. Descriptive words also help. It is best to think of consciousness on a spectrum extending from normal to coma. Mild disturbances in awareness such as confusion and delirium are on one end of the spectrum. As awareness decreases the patient becomes lethargic (extremely drowsy and repeatedly requiring awakening with moderate stimulation), which can progress to obtundation (in addition to extreme drowsiness, also has slowed responses to stimuli). Stupor describes a patient that will only arouse to vigorous and repeated stimuli and immediately lapse back into unconsciousness as soon as undisturbed. Coma is a state of unarousable unresponsiveness, the far end of the spectrum. Hypoxia should be addressed immediately whether this is via oxygen supplementation or endotracheal intubation. Hypotension can reflect circulatory failure from sepsis, hypovolemia or cardiac failure, specific drugs or Addison's disease. Extreme hypertension could suggest posterior reversible encephalopathy syndrome (PRES) or hypertensive hemorrhage. Both bradycardia and tachycardia can be the result of specific toxic or metabolic etiologies (bradycardia and hypotension, think beta-blocker/calcium channel blocker overdose). Bradycardia may also be the result of increased ICP as part of the Cushing response. Be sure to obtain a rectal temperature. Hyperthermia usually signifies infection but one should also consider heat stroke or anticholinergic intoxication. Hypothermia may be accidental or secondary to less common etiologies as adrenal failure, hypothyroidism, sepsis, or drug/alcohol intoxication. Respiratory pattern to be addressed in later section. Hypoglycemia is one of the most common causes of undifferentiated coma presenting to the ED and is easily reversible prior to initiation of further invasive workup. Significant hyperglycemia could prompt additional workup to evaluate for diabetic ketoacidosis (DKA) or hyperosmolar hyperglycemic state (HHS). Be sure to look for abnormalities that could point towards electrolyte imbalances or arrhythmias as well as characteristics of specific toxidromes. Prolonged QRS, consider tricyclic overdose. Sagging ST depression may represent digoxin toxicity. The physical exam in the comatose patient should be focused on identifying reversible causes of their depressed mental state as well as assisting with appropriate laboratory and imaging work up. The comatose patient should be completely exposed to assess for any clues that may assist with the etiology of their comatose state. • Unilateral pupillary dilation: assumed to be caused by oculomotor nerve compression from ipsilateral uncal herniation until proven otherwise. • Oculocephalic reflex (dolls eyes reflex): If intact, this reflex demonstrates functionality of a vast majority of the brainstem, making a brainstem lesion very unlikely to be the etiology of the patient’s altered mental status. Accurately documenting GCS early will help you to follow the patient's clinical course for improvement or deterioration. Beyond looking for clinical toxidromes or key exam findings, be sure to track down a list of the patient’s medications and pay close attention to any new additions or dosage changes. Obtaining further information from EMS, family or friends may be critical in making the diagnosis. Consciousness is the combination of arousal and cognition. Arousal is synonymous with awareness, both of self and surroundings. Cognition is the combination of orientation, judgment, and memory. In order to be awake, aware of our surroundings, and fully oriented, we require intact cerebral cortices and an intact RAS. A fully comatose state implies dysfunction either in both cerebral cortices or dysfunction of the brainstem where the ascending RAS fibers originate. The overarching goal of the physical examination of a comatose patient is first to treat any reversible causes and then to attempt to differentiate a structural lesion causing localizing neurologic findings from a more systemic disturbance. Thank you for your succinct review of a common, and often complex, chief complaint in the ED. The comatose patient, by definition, cannot provide much context or history to his or her condition, so the clinician must rely on examination skills and some of the heuristics mentioned in the post. As with all critical patients, the assessment should begin with the ABCs: airway, breathing and circulation, but should also add the D of dextrose. The point of care glucose is an incredibly powerful tool in the comatose patient and should be utilized as soon as other life threats have been addressed. Additionally, any comatose patient without a clear history of being found in bed or some other obvious overture to their current condition should be considered to have trauma. Perform a full secondary survey as soon as possible. This will help identify not just any occult trauma the patient may have sustained but also help evaluate skin parameters and tone. This is also a good time to look for transdermal medication patches that may be contributing to the patient’s mental status. While the patient is rolled, take the opportunity to obtain a central temperature – this can differ greatly from a surface temperature. 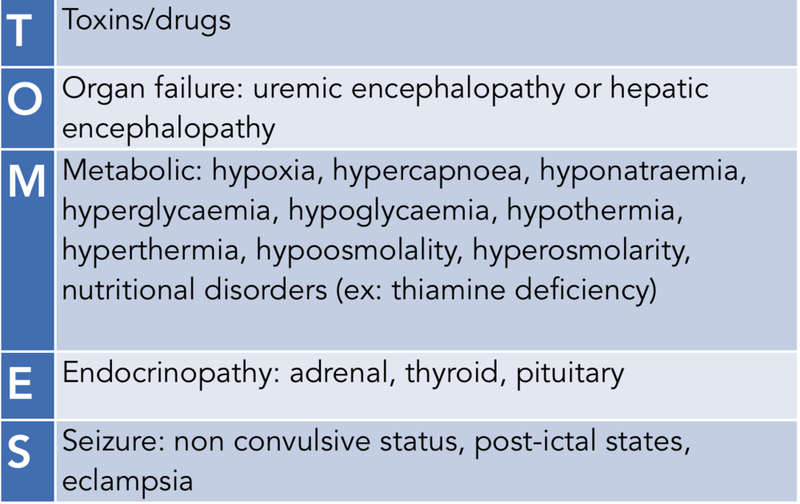 Characterizing causes of coma by age can be useful, however remember that infection and trauma can present at any age, and toxic ingestions can also present across the spectrum either as intentional or unintentional. This is where a thorough exam and choice laboratory and imaging tests can help. The list of blood tests in the post is quite extensive, although I would argue that one should recognize thyroid storm by virtue of exam rather than requiring a TSH level. An alcohol level can be helpful – it may justify your suspicion that the coma is simply due to profound intoxication – or it may remove that option from the table and require that you continue your investigations. Kussmaul breathing is NEVER normal. This should set all your alarms off. Worry about acidosis, either from infection or DKA (most commonly). However, if the patient smells of alcohol consider both AKA and toxic alcohol ingestion. GHB can present with profound coma. Often you can gain some insight from EMS who will report that the patient was found in a party setting. In these situations, provide supportive care – the patient may metabolize and wake up even during the course of your shift. Hyperthermia can cause altered mental status, but remember to look for the cause of the hyperthermia. Is this exertional? Is this an elderly person who was relatively immobilized by another condition? Was this person exposed due to immobility from trauma? Is this a toxicologic cause (eg serotonin syndrome, NDMA, anticholinergic ingestion)? While diagnosing the comatose patient can be a difficult task, relying on physical exam skills and a thorough approach can help direct initial plans of care. Keep an open mind, avoid early diagnostic closure, and always check that glucose! Adams, J., Bassin, B., Cooke, J., Barsan, W. (2013). Altered Mental Status and Coma. Emergency Medicine: Clinical Essentials. Philadelphia, Pa: Elsevier/ Saunders. Pages 811-817. Stevens, R. D., & Bhardwaj, A. (2006). Approach to the comatose patient. Critical care medicine, 34(1), 31-41.